Swift verruca treatment is an innovative new technology, developed in the UK, which has been licenced for the general treatment of verrucas and warts in Podiatry. 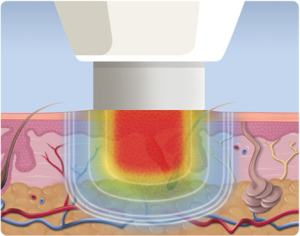 Swift uses microwave energy delivered through a special probe applied to the skin through a disposable head to treat the affected tissue with a thermal reaction. The usual way verrucas and warts are tackled by the body is as a result of keratinocytes in the skin activating dendritic cells so that T cells clear the infection. In stubborn verrucas and warts this healing process is interrupted so that the immune system is not alerted to their presence. 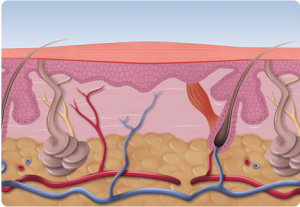 Swift microwave facilitates signalling between the skin and the immune system by stimulating the keratinocytes to activate dendritic cells. Also, it is thought the thermal reaction causes heat stress protein production stimulating a strong immune response. The combined response provokes and promotes an immune response that leads to the shrinking and eventual disappearance of the verruca or wart. The disposable head attached to the Swift machine has a life of 15 minutes and so multiple sites can be treated during the same visit. Most treatments are between 2 and 5 seconds in length depending on the power setting of the Swift machine. Some, following discussion with your Podiatrist, could be up to 10 seconds. Discomfort, or even pain, will be experienced during the fourth and fifth second ending as soon as the application finishes. Sensation will vary between individuals and there is rarely any lasting discomfort although there may be tingling feeling at the site for 24hrs. The Swift head is 7mm wide and larger verrucas will be treated in a series of overlapping applications. The skin remains unbroken, there is no bleeding, therefore no dressings are required and it is not necessary to keep the area dry. There is no requirement to modify physical activity following Swift treatment. There should be no scarring or other long term marking of the skin. In the days following treatment the verrucas may change colour, go dark and can look like a bruise. 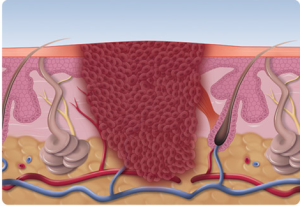 Large verrucas may not disappear straightaway but will reduce in thickness, or ‘debulk’ before resolving. Some verrucas simply peel off the foot. Many resolve after three treatments although some may require more applications. It can take up to three months after the last Swift treatment for the verrucas or warts to vanish as the immune response gathers pace. Treatments are normally spaced from two to six weeks. This is to allow the immune system to work and the skin to regenerate. It has been found that treatments closer together can bring benefit to the effectiveness of Swift but suitability can be discussed with your Podiatrist. If you would like further information about the Swift microwave treatment, verruca treatment in general, or to make an appointment with one of our Podiatrists please call us on 01628 773588 and speak to one of our receptionists.